In honour of the Queen's Birthday, which was celebrated here in New Zealand yesterday, Monday 5th June, I give to you Black Swan vindaloo : celebrating the extent of the empire from India to New Zealand! In many countries in [what perhaps once was] the British Empire, it is believed that the Queen owns all the swans and therefore it is a crime to kill and hence eat a swan. But according to my research just now, it seems that the Monarch of the United Kingdom traditionally only owns all unmarked mute swans on the River Thames. We are not near the river Thames and the swans in the Wairarapa don't seem to be mute. Let the games begin! In modern day New Zealand, the black swan has a season in which it can be hunted. So fear not! The swan of the vindaloo is entirely legal. I was given some black swan breasts by my brother-in-law who in turn was given them by a friend at work. We had no idea what we should cook with the swan meat. 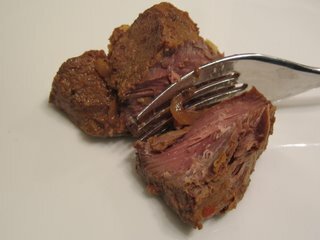 All we were told is that they can be tough, bitter and rather strong tasting and therefore best to marinate the meat overnight in milk or beer. I had been reading lately that marinating in alcohol can result in a tougher meat so I decided to marinate the swan breasts in milk. But then what? But inspiration struck - what better treatment for a strong meat than curry, and what better curry than a vindaloo? So how was the swandaloo? The swan meat, to me, was like a poor cousin of beef or venison. Dark and strong but not that handsome. I would rather have a beef or lamb vindaloo and if I have some venison then a medium rare steak is the order of the day. So frankly glad to try but should the opportunity rise again, I think I will order the bambi cutlet rather than the swan lake stew . . . I thought that this post would be more about the black swan than the vindaloo, so I will leave you with a link to a previously posted vindaloo recipe - feel free to use any meat you have to hand : supermarket, butcher, hunting-trip, or road kill! By the way - I apologise about the photo. We did not take a picture the night we ate it because while a photo can delay dinner at home, a dinner at a friend's house is a different matter, and we took the swan to our friends's house to share! I took the photo the next day with the leftovers I was saving to give back to my-brother-in-law so there were no accompaniments - but I thought it would be educational to illustrate how dark swan meat is and how it is like venison or beef. Long story, but there you have it! I had no idea that people ate swans. Of course, now that I think about it, it's not really that surprising. And not really surprising either that swan is pretty tough. We've found that with duck and goose as well. I wonder what swan stock is like. And risotto made from swan stock. Or how about nettle stuffed ravioli simmered in swan stock... a sort of Hans Christian Andersen "Wild Swans" theme. Although perhaps some people would say it was quite unsavoury - bordering on cannabalism, when one considers that the swans in the Andersen story were actually bewitched boys. Jeanne, it might well be that the restaurant really did serve duck. But there are ducks and there are ducks. The restaurant may have served ancient duck? We can buy whole ducks in Chinatown, but I have no idea how to choose them to know if they are going to be good or not. It would be wonderful to make one's own confit! Any ideas on how to tell if the meat is going to be tough or not? I do think that the swan flavour was good, just quite strong and the texture of the meat was hard for me to appreciate. Perhaps a stock would be the perfect use? Part of the parcel of bird that we were given was Paradise Duck which is maybe more similar to what you had, Jeanne, which does support what Elizabeth says. It was pretty much indistiguishable from the swan. As for the toughness issue - I think the only way to tell is by judging the thickness of the meat fibres - the thicker the tougher. What do you think? Oh my, I thought you were joking when I started reading, I had no idea people ate swan meat! Ange - I was speaking to a friend in Nelson last night and she has swan burgers in her freezer at the moment, shot because they are a pest on her farm! You could try swan tat way maybe! Jeanne - You have to wonder but not think about it too much! I hate black swans. They are just fowl. They should be cooked and eaten. Everyone eats duck meat,chicken meat, Turkey so I don't understand the need to protect swans from bring eaten.it's just an additional food course.